A fresh take on this Southern favorite will give you an antioxidant boost for your brain. If you like things spicy, add a few hot pepper flakes with the lemon juice. Remove stems and tough center ribs from greens and rinse well to remove dirt. Stack leaves and cut into 1-inch wide strips. Bring a large pot of salted water to the boil. 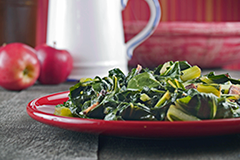 Add collard greens and cook 15-20 minutes. Drain well on paper towels. Heat olive oil in large sauté pan over medium high heat. Add shallots or onion, greens, and lemon zest. Season with salt to taste. Cook 5-7 minutes, tossing frequently. Remove from pan and squeeze lemon juice over. Taste and add more salt if necessary.